Watching his mother go through physical therapy after a rotator cuff injury inspired Christopher Atkinson to make physical therapy his career. Already into health and fitness and holding a bachelor’s degree in exercise science, the Pensacola, Fla., native set his sights on the Doctor of Physical Therapy (D.P.T.) program at UCF. Although it took him three years to get accepted, the wait was worth it. This fall, Atkinson became one of the first students to use the program’s new Anatomage Virtual Dissection Table, which gives him a tremendous advantage over most other D.P.T. students in the country. 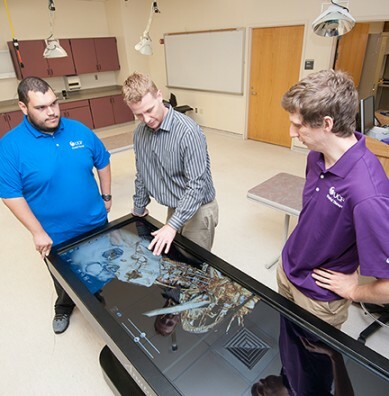 The Anatomage is essentially an 8-foot iPad, but the technology inside makes it a virtual operating table. Using images of real human cadavers, students can virtually dissect full-size 3-D images of a man or a woman. A touch of the screen removes various layers of the body, revealing the bones, the muscles, the nerves and the veins and arteries. Another touch rotates the images, and a swipe of the finger makes a digital cut displaying just what a student would see on a physical cadaver. The table also allows students to use digital instruments to see the effects they would have on muscles and tissues. Although UCF has one of the first D.P.T. programs to adopt the new technology, Program Director Patrick Pabian, D.P.T., had his eye on an Anatomage table for a while. After the UCF College of Medicine purchased one, he talked with anatomist Andy Payer, Ph.D., who gave the table a very positive report. The Anatomage will help prepare surgeons, but in Pabian’s eyes, it will provide equal or possibly even more value for his physical therapy students, who must have a high level of knowledge in anatomy for their professional practice. The table is one of the ways UCF’s program is an innovator among D.P.T. programs nationwide. UCF already was unique by having its own anatomy lab that is not shared with other programs such as medicine or dentistry. The Anatomage is housed in this lab, a restricted-access room in the College of Health and Public Affairs, where D.P.T. students have 24/7 access to it. Images from the table also can be projected for all students to see during class, another helpful option. The Anatomage will not replace physical dissections or textbooks, but it will allow students to learn in alternate ways. Pabian was advised to turn his students loose on the machine and let them discover just what it could do. And that’s what he did. Each day presents new learning opportunities for the students, who are “finding more and more features of this technology faster than the speed of light,” he says. Local first-year D.P.T. student Kyle Perkins thought the table felt like a big toy at first — a very practical, educational toy. He finds it useful that he can virtually dissect a human body — or several bodies — before performing on a real cadaver. He and Atkinson agree that it’s helpful to practice virtually beforehand.